Glowing Lilies is so full of wondrous colour with its fantastic multi coloured Asiatic Lilies that this never-to be-forgotten beautifully ribboned bouquet will if not sweep your special someone off their feet, will certainly be the reason for a big beaming smile! 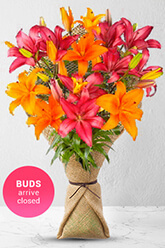 Lilies may be sent closed/partially closed in order to prevent damage and to last longerVase not included however; we recommend a superior vase as the ideal selection to complement these Glowing Lilies. Flowers were delivered on the day, very happy with the service. Also the recipient was amazed with the Flowers presentation. Thank you! My Mother loved her flowers which makes me happy and yess they look great!! A service I shall keep using!! My mother said the flowers were beautiful and they certainly caught me eye after looking at all the florists websites around the delivery area, thankyou very much! Very fast and efficient ordering and delivered perfectly on time for Valentine's day. Thank you!